We have set up our a7II and a7RII cameras with similar custom buttons and functions, so that we can easily switch between them. We bind back button focus to the AF/MF/AEL switch lever. Normal autofocus is the up position of the lever, and Eye AF is the down position of the lever. The thumb rests around there naturally, so we keep the button pressed down when we need to lock on a subject, and press the shutter as needed to take a photo. This is a very fast and intuitive method for autofocusing. 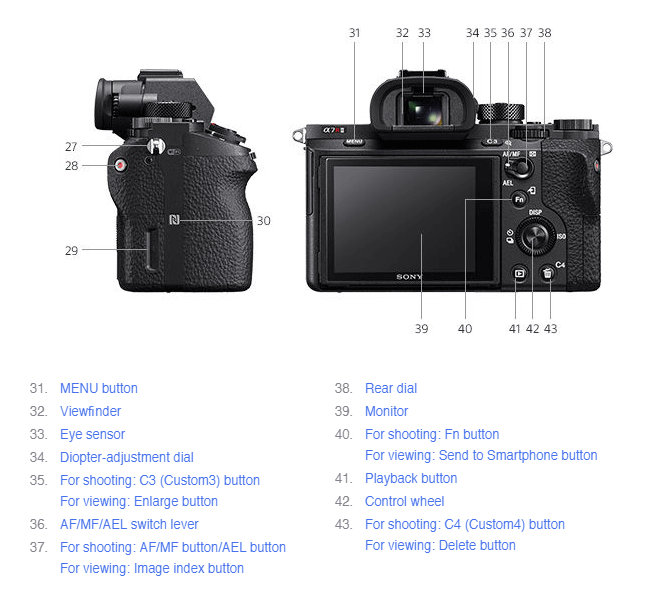 Note that on the a7II, Eye AF is only available in AF-S. On the a7RII, Eye AF works in AF-C and in AF-S, but the focus confirmation box will disappear after a time in AF-S.
A particular face can be selected for Eye AF by putting the center AF point over that person’s face, holding down the back button and recompose. The autofocus will continue to track the person through the frame. We also turn off AF with shutter, so that half-pressing the shutter does not trigger the autofocus again and cause the camera to stop focusing on the eye. It also means we don’t have to refocus every time we let go of the shutter, and we can react quickly to a great moment by pressing the shutter as soon as it happens. When the person we are tracking is turned away from the camera or if the face is sufficiently far away, we switch the lever to the up position, using continuous lock-on AF instead of Eye AF. The lock-on tracking keeps its target fairly well, though it tends to prefer tracking larger objects (faces, whole bodies, cars, etc). In this case, the whole object will be sharp on average. Custom Button 1 — Focus Mode. Can switch between AF-S, AF-C, AF-A, DMF, or MF. Custom Button 2 — Metering Mode. Switch between Multi, Center or Spot. Custom Button 3 — Smile/Face Detect. This has the zoom or magnifier button. Can switch off face detection here so that the autofocus does not get sidetracked by faces. Custom Button 4 — SteadyShot. This button has a trash can icon next to it, which helps us remember to use this to turn off 5-axis stabilization or SteadyShot for mounting on a tripod. Center Button — Focus Settings. Push the button, use the direction buttons to set the focus spot, or turn the dial to change the autofocus mode. We often use Lock-on AF: Flexible Spot, Center or Wide. Left Button — Drive Mode. This is the default. Switches between Single Shooting, Continuous Shooting, Self-Timer or Bracketing. We leave it on Single Shooting most of the time. Right Button — ISO Auto Min SS. By default this button says ISO, and it is useful to remember this function. We usually set this to Faster setting for taking portraits or otherwise Standard. On the a7II this button is set to ISO, which is the default. Down Button — Finder/Monitor Sel. We shoot with the LCD or “monitor” most of the time to have more awareness of our surroundings, but in bright sunlit situations we use the electronic viewfinder. Make sure to set this option to NOT “Auto” for the custom button to work as a toggle between the LCD and the view. Note that on the a7II this option is not available. AEL Button — Eye AF. This is the down position of the toggle. Hold the button down to use continuous Eye AF. AF/MF Button — AF On. This is the up position of the toggle. Hold the same button down to use normal AF, either continuous or single. Focus Hold Button — Focus Hold. This is a button that only exists on some G-branded lenses, on the lens itself rather than the camera body. We set this button to Eye AF when possible. Function Upper3 — Flash Comp. Audio Signals: Off. This is probably the first thing we do on the camera, because the beeping is annoying! Auto Review: Off. During shooting, the auto review just slows us down. Picture Profile: Off. It is advisable to set this to a color profile for video (PP5 is Cine1, PP6 is Cine2, and PP7 is S-Log2), but to leave it off for stills. Long Exposure NR (noise-reduction): Off. Generally speaking it is easy to post-process the noise, but you may want to turn this on if you plan on taking longer than 15-second exposures. E-Front Curtain Shut. : On. This will result in sharper images due to dampened shutter vibrations. In some situations such as extremely high shutter speeds, this can cause banding. Use at your own discretion. Silent Shooting: Off. Only turn this on when you absolutely need to, because it results in 12-bit images instead of 14-bit. Focus Magnif. Time: No Limit. We also set our camera to Airplane Mode, which disables the Wi-Fi function and helps conserve battery. We can get over 1000 shots over the course of a 2-3 hour photo session, on a single battery charge. Brian Smith, a Pulitzer Prize-winning photographer, has a great guide to adapting Sony A-mount and Canon EF-mount lenses on Sony E-mount, as well as a more in-depth look at some great new settings on the a7RII. Great write-up, thank you for posting! I just got the Batis 85mm and this is very helpful for the autofocus settings. Great setup information. Just what i was looking for. The manual is pretty bland and not a quick read. Thank you so much. I now have my camera setup exactly as you have described. This is extraordinarily helpful; so happy I came across this. Thanks for the effort that you took to make this so detailed and clear. 1 of the best settings i ever seen so far especially when using A7ii & A7Rii together, thanks so much. Hello everyone. I just got my A7ii. Looking for some help here. I’m coming from a 5Dmk3 and while I’m not trying to set it up the same way I would like to know Agee things. A. Is there a way to see the shutter speed change while adjusting ISO on Aperture Priority? On my canon if in A Priority as I thumb the ISO wheel I can see the speed change. I really would rather not use auto ISO to ensure I have the lowest possible ISO with the speed I want. Is there a way to reassign one of the wheels other than the control wheel to use as ISO adjustment while the other controls F Stop or Speed depending on what mode I’m in (A Priority or S Priority)? Exercising my new A7Rii… using Nissin i40 flash set on TTL with zero exposure compensation… the flash has settings almost as various and complicated as the Sony… for now I’m curious about all the A7Rii options for hot shoe mounted flash… I tried most of them with mixed outcomes… I wonder what are the intended purposes of the flash settings fill-flash, slow sync, rear sync, wireless (does this mean my camera can fire an unattached flash, perhaps the one I have?) and auto-flash… additional issues, perhaps for another time, are the flash itself has a label “zoom 24-105mm”. My lens is a Sony servo/manual 18-200mm. Am I in trouble because the zoom functions aren’t compatible? Nice write-up! What I find quite frustrating is that A7S owners like me don’t have the option to assign a custom button to “Finder/Monitor Sel. “. The “auto” mode is not reliable, as it turns off the lcd too easily, and attaching a piece of electric tape over the eye-sensor (as many suggest as a patch) shouldn’t be necessary if Sony listened to their customers. Is it so difficult to offer that via a firmware upgrade? Come on sony.. it is really simple. Does “focus hold” work in video mode? In photo mode, it keeps the in-focus object in focus as continuous focus tracking; does it do the same in video mode? I could not find the answer in the A7R II user sensual. The reason I ask for it is that, now I have 2 G lenses to choose from with A7R II for photo and video: Sony FE PZ 28-135mm f/4 G OSS , which is specifically made for video cam; and the newly announced Sony FE 24-70mm f/2.8 GM Lens. Both have a “focus hold” button on the lens, but the specifications in the new GM lens does not mention “parfocal focus”. Can the “focus hold” be a workaround for parfocual? Again, thinks for the article on setting up customized bottoms and settings for video shooting. Hello, I would love to learn more on Videography using my Sony a7II. Can I please ask your settings in Sony a7II when you are filming? Also, how can I get autofocus in video if the person is moving. The reason I ask this is because my cousins and I are planning to do our own Music Video for the family. Thank you for your help. Hi Roel, our video settings are fairly similar to our photo settings. For autofocus during video, you want to be in AF-C and have face recognition on. We are not very experienced with video, so you may want to do some more research and ask those who have better video knowledge. Thanks much for the clarification of the Eye AF difference between the a7ii and a7rii cameras. I was trying to use Eye EF on AF-C focus mode with my a7ii like I do all the time on my a7rii and I kept getting a default message and could not figure it out. I was very close to doing a hard reset on the a7ii when I came across your explanation through a Google search. Saved me a lot of time and much frustration. Greatly appreciated! Can you assign the Crop sensor option on the A7Rii to one of the Custom Keys? I’ve a battery grip so I’m gaining 4 more custom keys to use. I loved having this guide when setting up my A7II. Any chance you’ll be doing an updated version for the A7III or A7RIII? Why eye af is not working with my a7ii? Hi Julius, the a7II can only do eye AF in single-shot or AF-S mode. It cannot continuously track an eye in the frame in AF-C mode. Among Sony full-frame mirrorless bodies, a7RII, a7RIII, a7III and a9 can do continuous eye AF tracking. sivaramanan, you’ll need to set it to a custom button through the custom button assignment process. From there, you hold the assigned eye AF button as a form of “back button focus”.